I didn’t expect to like the HTC 10. It had been a while since HTC built a truly great device, and my colleague Ben Woods, who reviewed the phone, thought it did a poor job of standing out in a field where competitors seem to offer much more. On paper, I agreed. LG tried to revolutionize smartphone design with the G5’s modularity, while the S7 perfected Samsung’s new flashy design language with even more features, and comes with virtual reality support. The HTC 10, by comparison, seemed positively dull. But it turns out you don’t need to try to change the market in order to create a really good phone. Here just a few reasons I think the HTC 10 is the best of the current batch of non-Nexus Android phones. The HTC 10 looks a lot better in person. Nothing about the HTC 10 is flashy, but everything about it exudes quality. Leaks made the phone look half-boring and half-ridiculous with its huge chamfers, but they really do make the phone catch the light in interesting ways. The HTC 10 looks refined and feels great in hand. While I love Samsung’s new design language, the HTC 10 isnt prone to infinite smudges, and unlike the G5, you have no doubt it’s made of solid metal when you pick it up. Moreover, it just feels great in hand. The curves comform to your grip, and it’s not as slippery as the S7. The heft and shape make it surprisingly easy to use one-handed. It’s impossible to avoid smudges on the S7. Even the display impressed me. While I thought I’d sworn off LCD’s for good because of AMOLED’s superior blacks, the HTC 10’s more realistic colors makes a case for the former technology. Look, I love stock Android as much as the next guy, but every once in a while, third-party customization can add to the experience. Firstly, most of the HTC 10’s UI does look like stock Android. The notifications shade and settings menu are virtually identical for instance, and HTC chose to minimize duplicate apps by often using Google’s software instead of its own offerings. Also important: HTC’s icons aren’t terribad. You’d be hard pressed to tell the settings menu apart from a Nexus’. Most of what is different from stock Android is thoughtfully implemented, with seemingly no performance overhead. HTC’s launcher is one of the better around, providing more organizational tools than Google’s option, as well as numerous theming options. If it weren’t for the fact that I prefer Google Now to BlinkFeed, it stick with HTC’s. Going back to the display, I love that I can easily choose between ‘Vivid’ and ‘sRGB’ colors depending on if I want punchiness or accuracy, and HTC even lets you customize the color temperature of the display – something no other manufacturer I’m aware of lets you do. Being able to change your screen’s color temperature is a very handy touch. Other thoughtful but unobstrusive features include a ‘glove mode’ for the winter, gestures for waking the phone or opening the camera, Apple AirPlay support, a perfomance optimizer app (basically HTC’s take on CCleaner), and a great equalizer implementation (more on this later). The HTC 10 feels faster than it should. The specs are virtually the same as the S7 and G5, but near-stock Android makes it zip through the UI in a way I normally don’t see outside of Nexus devices. Couple that with HTC’s history of providing timely updates, and it bodes well for the phone’s long-term performance. 83 percent with a little under an hour of screen on time. It also gets a lot of mileage out of a 3000 mAh battery given its 5.2-inch, QHD display. I regularly get over 4 hours of screen-on time in my typical heavy usage, and that’s without ever bothering with power-saving modes. It’s also one of the few phones to come with a Quick Charge 3.0 adapter right in the box (LG supports the standard, but only comes with a 2.0 charger), and so far HTC’s claim that it can charge 50 percent in half an hour have remained true. While I’m still adamant the G5’s dual-camera set-up makes it the best smartphone for amateur photographers, I appreciate HTC’s minimal camera UI. It mostly gets out of your way, but you can easily switch to a ‘Pro’ mode or access extra features if you need them. Meanwhile, Samsung and LG’s UI are overflowing with information and overlays. Also, though pretty much every major Android phone can shoot RAW now, props to HTC for being the only smartphone with built-in RAW processing – even if it doesn’t do very much right now. I’ve used the finger-print sensor on just about every flagship out there, and the HTC 10 beats them all in terms of speed and reliability – yes, even the iPhone 6S. The fingerprint sensor is excellent. 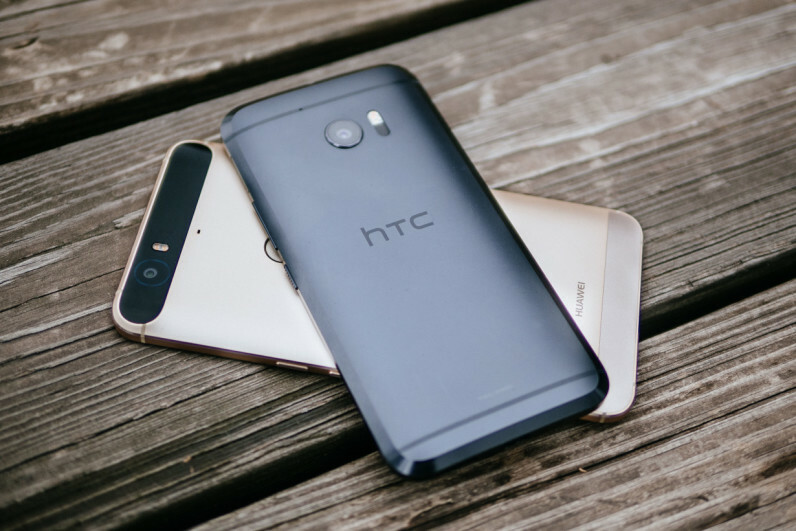 Whether that’s because of a better fingerprint sensor or smarter software – the HTC 10 has a relatively long and picky fingerprint setup process – the phone very rarely asked me to try again. While no, HTC’s new BoomSound technology isn’t quite as good as its old stereo speaker system – or the stereo speakers on the Nexus 6P, for that matter – it sounds better than your average single speaker smartphone. It also doesn’t get muffled when you cover the bottom port like the iPhone 6S or Galaxy S7. The dual-speaker setup means sound isn’t muffled when you’re holding the phone with one hand. More importantly, the 24-bit sound chip in the HTC 10 is great. it gets really loud, and can drive high-impedance headhones and has supremely clean signal. It also has one of the best equalizer implementations I’ve seen; HTC asks you to listen to a variety of tones at different pitches so you can balance sound according to your listening preferences and your headphone’s frequency response. You can even save multiple profiles for different headphones. Everything about the HTC 10 feels carefully considered in a way I’m not used to seeing outside of Nexus or Apple phones. Little to no bloatware? Check. A not totally annoying UI? Check. Those details may not grab headlines, but they make for a great user experience, and there are just enough features over stock Android to make the difference worthwhile. The minimal extras also mean updates might come faster than on the G5 and S7, and HTC has a good track record with updates anyway. That’s not to say I don’t wish the company did something more innovative – imagine if LG had managed its modular design on a phone with HTC’s hardware and software – but I’ll trade an all-around refined smartphone over features I’ll rarely use and gaudy UIs. An HTC-built Nexus could be wonderful. I’m not alone either: Phone Arena, Android Police, 9to5Google and Android Central all held reader polls comparing the 10, S7, and G5 – HTC came out on top in every one. Of course, tech blogs cater to a nerdier demographic that may not represent final sales, but it goes to show for a lot of people, less is more. Here’s to hoping that those rumors about two HTC Nexus devices are true.